Greg Cangialosi ’96 (far right) talks with students about careers in the startup industry at the Betamore Startup Crawl, which he hosted in May. As a master of marketing tech and entrepreneurship, UMBC alumnus Greg Cangialosi ’96, English, always seems to be two – or ten – steps ahead of pretty much everyone else. He has to be. When many of us were still figuring out listservs, his vision for power e-marketing was already permanently changing the communications scene. When we finally started to grasp the concept of “the cloud,” he had already measured potential and created a community for big thinkers and even bigger collaboration. Follow him on Twitter, and it sometimes feels like time travel. And yet, in the best of ways, Cangialosi is an old-fashioned guy with a timeless sense of what really matters. A generous volunteer, he embraces the three pillars of philanthropy – time, talent and treasure – and UMBC is all the better for it. Last month month, Cangialosi made a five-year commitment to UMBC totaling $100,000 to support the creation of a business innovation competition and an endowment that will support student entrepreneurship initiatives, including everything from new courses, guest speakers and potential seed money for budding student start-ups. “I have had wonderful experiences in all three realms of giving back and I think they are all important as they all make an impact,” said Cangialosi, who sold his start-up email marketing firm Blue Sky Factory in 2011 and recently co-founded Betamore, an 8,000 square foot “urban campus for entrepreneurship and technology, focused on three main areas, education, community and incubation” in Federal Hill. “Greg’s relationship with campus has so many dimensions,” said Greg Simmons ’04, Vice President of Institutional Advancement. Cangialosi’s gift will further solidify UMBC’s entrepreneurship program, said Vivian Armor ’73, director of UMBC’s Alex.Brown Center for Entrepreneurship. She expects the Cangialosi Business Innovation Competition to become a major source of support and inspiration for students looking to become successful entrepreneuers. “We’ll be able to create a very immersive experience for students,” including potential cash prizes for winning ideas, as well as structured mentorship opportunities, she said. Through his teaching and connections to UMBC, Cangialosi has been able to further provide opportunities for students. Recently, Betamore hosted a “Startup Crawl” for more than 80 students from around Baltimore (including a couple dozen from UMBC) as a way of “getting students exposed to the startup scene here in Baltimore, and at the same time exposing new emerging companies to the amazing talent pool here in Baltimore,” Cangialosi said. Twenty companies participated, all of whom were hiring either full time positions or internships. Students mixed and mingled, getting a taste for employment options they might not otherwise have considered. “Aside from networking and meeting a lot of the founders, a portion of the Startup Crawl also included a session in which each company presented to all the attendees,” said senior Andrew Mavronicolas, who recently took Cangialosi’s class, and who is majoring in information systems with a minor in entrepreneurship. “From this, we not only learned about their companies, but some of the struggles they went through along the way. 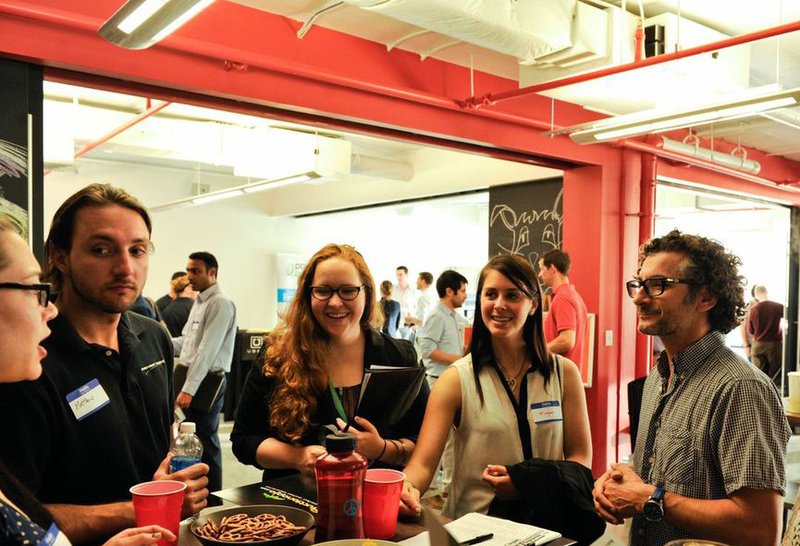 Always looking ahead, Cangialosi is already hoping to host another Startup Crawl for the fall. And UMBC students will definitely be a part of it. Learn more about entrepreneurship at UMBC here.